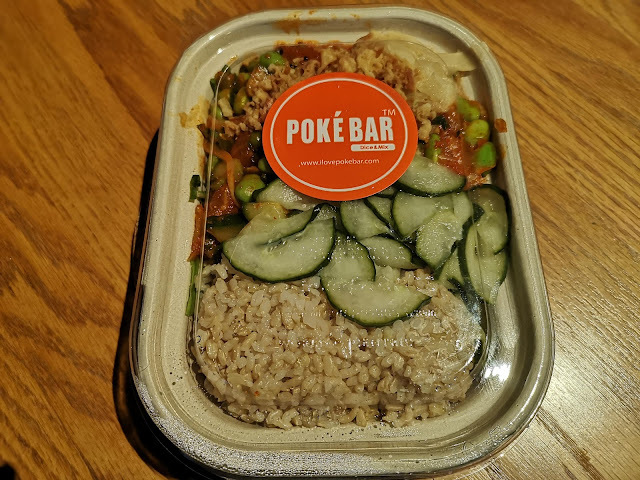 Poke Bar is not a local phenomenon. According to their web site, they have over 70 locations mostly in the US but there are a few in New Zealand and Canada too. So this is not their first attempt and it is evident. I tried a couple of things. 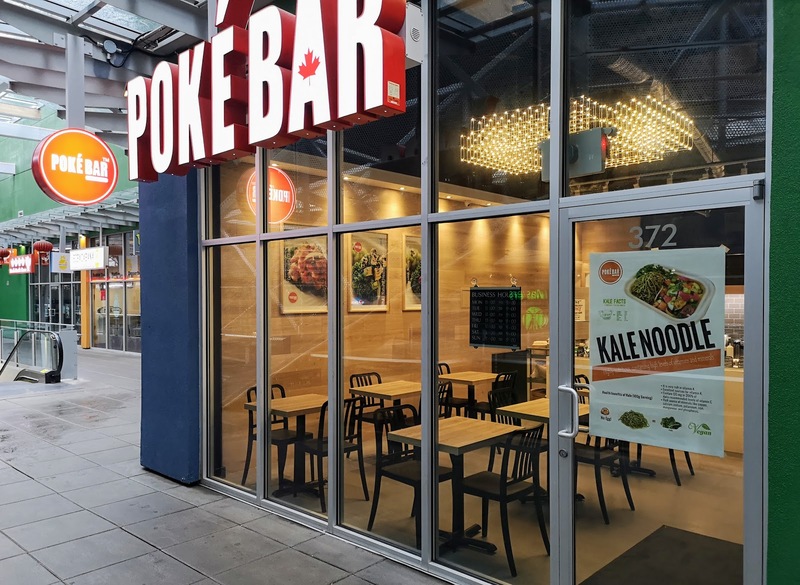 Unfortunately, they were out of noodles because their Kale Noodle special was intriguing. 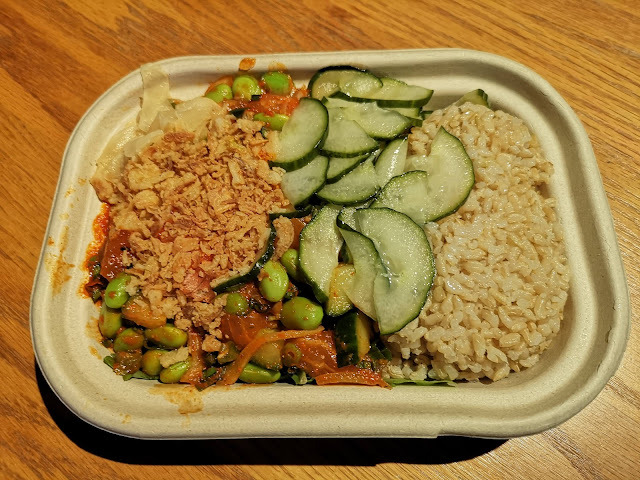 Instead I had a medium signature bowl , the name of which I cannot recall. 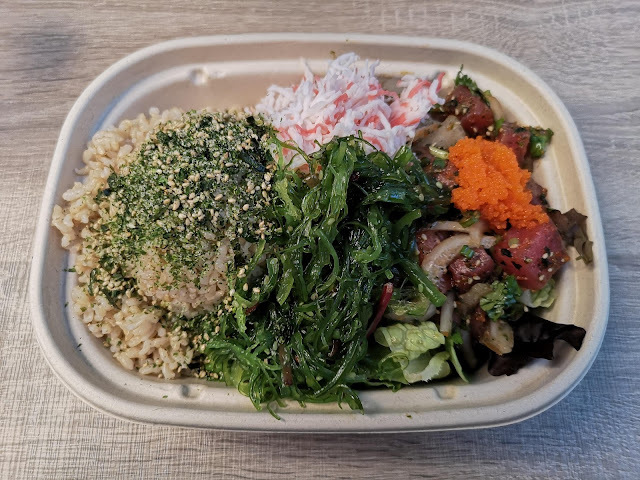 It was a bit of a feast, starting with a generous amount of luscious Ahi Tuna, brown rice, salad greens as well as (at my option) seaweed salad, massago, imitation crab and their sesame seed/ seaweed topping. For $15, I though that I got my moneys worth and was completely happy. I also ordered a small Spicy Salmon Bowl. This was a special that came to $10. A little squished by the lid, this started with some very good, presumably Atlantic Salmon. Again I chose brown rice (you have the option of white rice, usually noodles or salad), greens, edamame, massago again and crispy onions. We certainly have our choice of poke places these days but this one is both convenient (right at the skytrain station) and offers tasty dishes at a decent price. The folks there were friendly and patient with me as I pondered the many options. It is worth a stop if you are in New West!